You’ve got questions, we’ve got answers. Here’s the low down on what to expect. The Camera Course is for beginning to intermediate photographers. We offer two classes, so you can choose what suits you best. Are you totally overwhelmed by all the buttons and dials on your camera? Join us for the morning class where we begin with how to hold your camera. Ready to start playing with ISO, aperture and shutter speed? Then the intermediate class is for you! 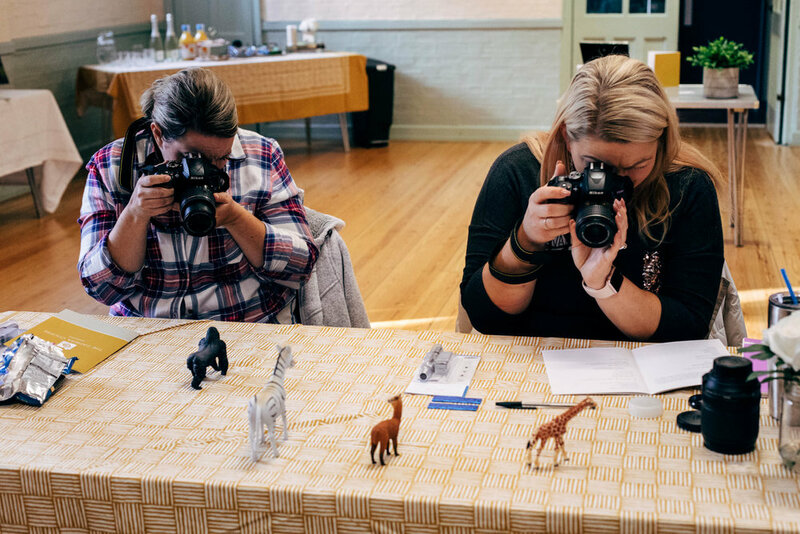 This is the perfect class for hobbyists and anyone eager to start shooting in manual. Feeling ambitious? Join us for both sessions and enjoy lunch in between where you can pick our brains with all your photography (or not) related questions! This is a fun, hands-on course for anyone who loves photography but is stuck in auto mode. We’ll discover what all those knobs and buttons on your camera actually do, learn basic composition, discover light and have you taking better pictures by the time we’re done. Whether you join us for the beginner course or the whole day, you can be sure that each lesson will be broken down into manageable pieces. With a workbook, slideshow, verbal instruction and lots of time for shooting, we’re dedicated to making the concepts stick no matter what your learning style. Have no fear! We’ll start at the very beginning by covering the basics of your camera and lens and all the accessories that come with. We’ll even cover what you do and don’t need (hint: it’s not always the gear that makes the best photos). We’ll explore composition, light, and perspective – and that’s just the beginner’s class. The intermediate class will go even more in depth; from shooting in manual to white balance and even a bit of Lightroom. And if all of that sounds like a foreign language, that’s okay (come hang out with us and we’ll explain it all). By the end of class, you’ll be confidently calling yourself a photographer! Do I need a big camera? The quality of your camera isn’t nearly as important as your willingness to actually learn how to use it! While you could still gain a lot from this course just using an iPhone or a point and shoot, we highly recommend a DSLR. That’s a fancy way of saying to bring a camera with an interchangeable lens. Our favorite lens for new photographers is the Nifty Fifty. It can be purchased via Amazon for around £100 (just search for 50mm f/1.8 in your brand – Canon, Nikon, etc). Don’t have a DSLR but still want to join? We have a limited supply of cameras you can loan for the day.